The Earl of Hartwick delights in scandalizing the ton with his behavior. But it’s his turn to be scandalized when, on an escapade, he bumps into Miss Sarah Forrester—in the rain, at night, on a rooftop! Sarah is hunting for a diamond, and the last thing she needs is the infuriating Hart distracting her. But he’s looking for the jewel, too! They may be rivals, but the sparks between them are uncontrollable. And soon Sarah finds herself longing for another treasure—becoming Hart’s American countess! Sarah Forrester needs to find the priceless golden-yellow jewel otherwise her family could be torn apart, what she has always known and respected has been taken away from her and worse than that her family could suffer. This secret if it gets out will ruin everything, it will destroy everything she holds dear and she cannot let that happen. She is a tough cookie and she will fight tooth and nail to make sure that no one hurts her family and to do that she must find the jewel herself. The only problem is that irritating and talkative Lord Hartwick; otherwise known as Hart is also on the hunt for the precious stone after being coerced into the hunt by the Prince Regent. As they keep bumping into each on their quest to find the jewel, Sarah starts seeing more and more of the enigmatic Hart and soon her feelings change from mildly interested sightseer to something else something that could get her into to trouble and its trouble that she really doesn’t need. I had my eyes set on Hart the moment I met him in the last book and I am so pleased that Laurie has given this scoundrel his own story, it may make his already overly large head bigger but he needed his own story and what a humdinger it is. He is an enigmatic, suave and absurdly handsome devil who can charm the birds from the trees with his silver tongue. The chemistry between Hart and Sarah just sizzles, they are both witty, intelligent and complex individuals that take no prisoners when sparring. Their differences are what makes them such a perfect pair. Hart’s sophisticated silver tongue paired with Sarah’s sharp mind and caring persona, makes for a fun and very entertaining to-ing and fro-ing between them. Insufferable man! If only she could give him a push, but with her luck he would land on his back and see it as an invitation to activities he was most familiar with – or so she had heard. He is such an intriguing man! He is so smooth, he knows exactly how to use that silky charm of his to get what he wants, just like he knows what his charismatic aura does to woman but equally because of his role as advisor\friend\guard to the prince regent he uses that silkiness to protect the crown and the people he loves. His rakish exterior helps hide his true self, the side that he wants no one to know and thinks no one will want to know. When we first meet him he is the man that we all fell for in the previous book, the controlled charmer, the charismatic rake but we soon see that Hart really is so much more than that. I think that the real man, the man behind the mask, the man who has suffered and who is still suffering from his mother’s death, the private Hart is actually so much more charming than the rake could ever be. His hatred of his father is palpable in his actions and how he leads his life and once you get to know his past you realise just how much of a lonely and loving man he is. His relationship or lack of one with his father is such an important part of who he is and of the story, and to me it does explain a lot about him. As the saying goes: “We all walk in the shadow of the sins of our parents” and I think that is quite fitting where Hart is concerned, and once you have read The Unexpected Countess, you will completely understand where I’m coming from. This is great read, there is the perfect amount of romance and adventure with a huge, fabulous twist that is so unexpected. The Unexpected Countess is a huge success, a thrilling jaunt with an original plot. It is just so good! Laurie has really out done herself with Hart and Sarah she has done such a great job with them, especially Hart who is a seriously great man to get to know. I like Laurie Benson’s work her fun and charming personality just oozes off the page. But what I particularly like about Benson’s writing is that you get a real feeling of a writer who loves what she does, she puts her heart and soul into her work, her warmth is so palpable, her work is comforting as well as thrilling which I find so rare. This is yet another highly recommend read and one that should be read. This was an complimentary ARC copy from the author in exchange for an honest review. An Unexpected Countess is released on 23rd May and you can find it on AMAZON, to find out more about this book and where you can find it then check out Laurie’s WEBSITE. 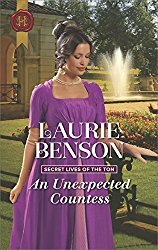 This entry was posted in ARC, Historical Romance, Reviews and tagged An Unexpected Countess, ARC, Complimentary copy, Historical Romance, Laurie Benson, Review, The Secrets of The Ton Series.